"It’s for the same audience that flocked to The Nest, Where’d You Go, Bernadette? or dare I say a little book you might be a fan of, Crazy Rich Asians." "The summer’s most compelling fictional exploration of affluence and envy. Like all the best beach reads, it eats the rich like so many frozen grapes." Relationships are awful. They'll kill you, right up to the point where they start saving your life. As this estranged clan gathers together, and Eloise's walk down the aisle approaches, Grant Ginder brings to vivid, hilarious life the power of family, and the complicated ways we hate the ones we love the most in the most bitingly funny, slyly witty and surprisingly tender novel you’ll read this year. Grant Ginder is the author of THIS IS HOW IT STARTS and DRIVER'S EDUCATION. He received his MFA from NYU, where he teaches writing. He lives in Brooklyn. "Fact: best title of any novel ever. This story about a dysfunctional blended family and a wedding in England is sinfully good." "A feast of bitchy characters, dysfunctional family dynamics and hilarious, over-the-top catastrophe." "Ginder takes family dysfunction to its hysterical limit in this joyously ribald, sharply cynical, and impossible-to-put-down examination of love and loyalty." "The summer’s most compelling fictional exploration of affluence and envy, it skillfully mingles the introspective ways of a domestic novel with the juicy stratagems of a page turner...Especially well-suited to this summer of our discontent. Like all the best beach reads, it eats the rich like so many frozen grapes." "An over-the-top dishfest that atones for the sins of its characters with sly humor and a surprisingly big heart." "Reading this book is like watching a really good indie rom-com...It’s a dysfunctional family saga; sort of like Cynthia D’Aprix Sweeney’s “The Nest” last year, but funnier... Ginder finds that careful balance of making fun of his characters while maintaining affection for them; by this saga’s end, you wish them all well." "A vibrant celebration of the modern family and all the crazy, hilarious and wild ways we love each other...This is the best wedding drama since My Best Friend's Wedding." 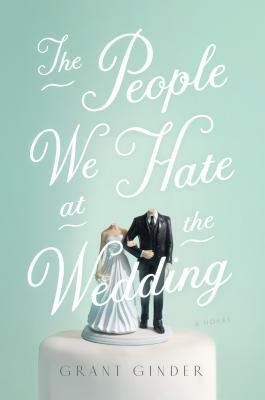 "Witty and completely absorbing, The People We Hate at the Wedding is family dysfunction at its best —full of heart, humor, and jealous siblings. This novel is addicting and entertaining and I couldn't put it down!" "Not only does it have the best title in the universe, The People We Hate At The Wedding is wickedly smart and shamelessly funny. Grant Ginder brilliantly captures privileged Brits clashing against semi-privileged Americans in the most hilariously cringeworthy ways. Cluelessly self-absorbed, appallingly outrageous, and so very endearing, these are characters I hope to be seated with at the next wedding I attend." "Don't be fooled by the superbly sardonic title—Grant Ginder's subject is not hate at all: it's love. Ginder expertly and hilariously shows us that real love (whether romantic or fraternal, parental or filial) is always a most complicated matter." "Ginder successfully captures the clash between people who are intimately connected yet deeply at odds. These characters are completely clueless and utterly self-absorbed yet highly likable, their trials and tribulations painful at times and joyful at others but always entertaining. Ginder’s latest is a fascinating exploration of family dynamics and the complex way we interact with those who know us best." "It turns out that the people we hate at the wedding are the very people we most love reading about. Grant Ginder's smart, funny novel is madly insightful and contains some of the most delightfully difficult and fabulously flawed characters I've encountered in a long time. I found myself worrying about them as I drove to work, hoping things would turn out well for (almost) all of them." "Ginder has a gift for the gleefully outrageous, dishing out one over-the-top scene after another... A daisy chain of debacles makes time spent with people we hate good fun."